Crisp and crunchy, or soft and chewy, this biscuit recipe collection includes brilliant biscuit recipes for every occasion. Traditionally referring to a baked, wheat-based snack, biscuits now cover a huge variety of flavours, ingredients, textures and cultural influences, from the German lebkuchen found in Christmas markets, to the oat and coconut Anzac biscuit of Australia. 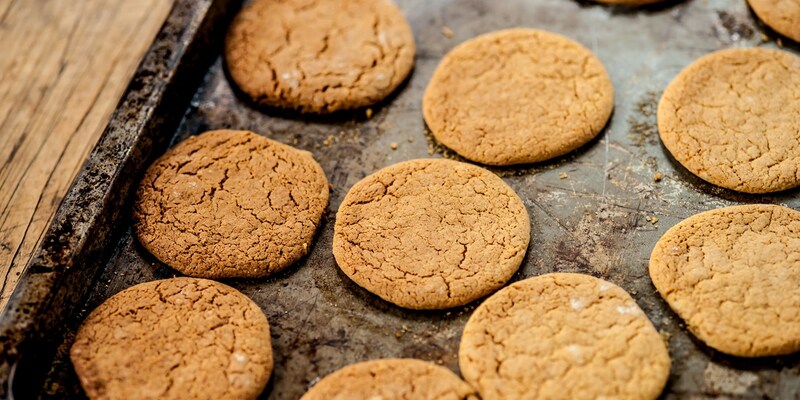 For traditional biscuits, there are Josh Eggleton’s lightly spiced ginger snaps, or Adam Stokes’ crumbly, buttery vanilla shortbread. Theo Randall’s nutty Italian biscotti are perfect served with coffee, while Frances Atkins’ elegant Florentines are a tribute to classic French patisserie. Not just perfect for those with a sweet tooth, savoury biscuits are the perfect accompaniment to a cheeseboard, and our collection includes the delicious fennel and Parmesan biscuits recipe from Kevin Mangeolles, or Marcus Wareing’s simple pumpkin seed and thyme oatcakes recipe.